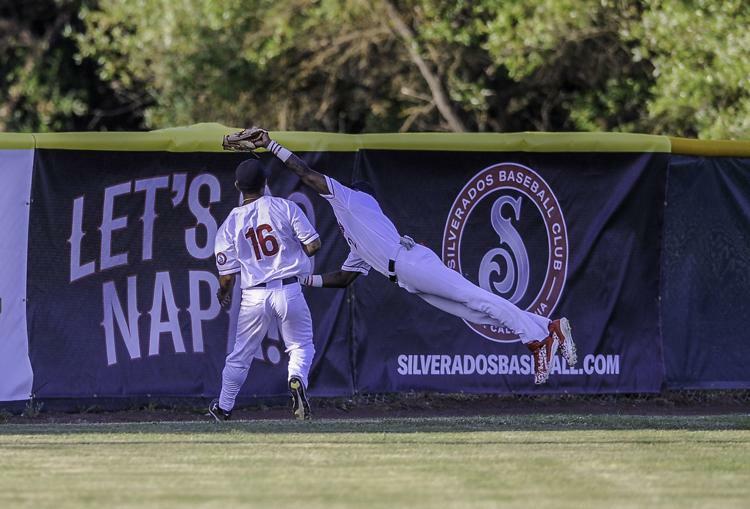 On an opening night when the Napa Silverados wanted everything to go perfectly, it pretty much did. The pre-game festivities with baseball and sports celebrities had the announced crowd of 415 buzzing with excitement as Silverados starter Scott Harkin climbed the mound for the first pitch of the first game in club history. No one was quite sure what to expect, as the local side and the league were new to Napa sports fans. But it didn’t take long for the Silverados to start a love affair with locals that could go on for a long time. After Harkin dispatched the first three Pacifics batters with ease, everyone was excited to see what sort of bats manager Tito Fuentes Jr. and his staff had gathered for the inaugural season. The Silverados left no doubt they would be entertaining and a force to be reckoned with in the PAPBC by batting around and putting up a seven-spot in the first inning. Leadoff batter Ray Jones bounced a seeing-eye single up the middle off Max Beatty, the ace of the Pacifics staff. Nick Kern followed with a walk. After Taylor “TC” Mark struck out, muscle-bound Josh Montelongo strode to the plate with ducks on the pond and mayhem on his mind. Beatty accommodatingly threw the first pitch right down middle and Montelongo crushed it high and far into the night for a three-run blast. The home crowd erupted as Montelongo circled the bases, and had barely sat down when teammate Dom Bethancourt sent an absolute rocket over the left-centerfield fence on the first pitch he saw to make it 4-0. But there was more to come, much more. Nicco Toni almost made it three in a row, but his drive to center – which appeared to go out – was ruled a ground-rule double. A clearly rattled Beatty hit the next batter, Jordan Anderson, and Nick Gotta hit a routine grounder that was bobbled by the Pacifics defense, allowing Toni to score to make it 5-0. De’Andre Asbury-Heath soon doubled in Anderson, and Jones got an RBI groundout to make it 7-0 before the carnage ended on Beatty’s 42nd pitch of the inning. The Napa Silverados second baseman Nick Gotta (17) avoids shortstop Nick Kern to catch a San Rafael Pacifics popup in shallow center field Friday night. And the game, barely 30 minutes old, was over for all intents and purposes. Needless to say, Fuentes was feeling pretty good after this one mercifully ended three hours later. The Silverados were clearly first-ball hitting, the two home runs as a case in point. “I said before the game, ‘This is not college anymore. You’re not going be wasting pitches at this level. You’re going to put a good swing on the first good pitch you see.’ I wasn’t expecting a 12-3 win, but I definitely wanted to win and I knew we had worked hard and had some good sticks,” the manager said. Harkin labored here and there, but would have been credited for five shutout innings had his defense not botched a double play in the fourth that eventually allowed the visitors to score twice. He was aided in the third, however, when center fielder Asbury-Heath made a diving catch on the warning track to keep the Pacifics off the board. Drue Bravo relieved for the Silverados in the sixth and was never seriously threatened. Napa tacked on single runs in the third and fifth for a commanding 9-2 lead. The Silverados added three more runs in the seventh thanks in large part to a two-run single by Kern. But Fuentes was clearly optimistic about the young season. “As you are building into the season you have to make some choices on one player over another, and what I saw tonight made me feel like we had made some good decisions,” he said. As for Friday’s 6 p.m. game return game against San Rafael, he predicted the Pacifics would pitch the Silverados a little differently. “I am going to tell the guys, ‘The best pitch you see in the at-bat is the one you need to swing at,’” Fuentes said.